Geico’s been throwing Foghorn Leghorn’s ridiculous narratives in my face for well over a year with its deftly humorous commercial. Yet, with fewer channels interested in playing Looney Tunes reruns in past years, I’ve been bereft of Leghorn and crew for well longer than that. Lack of Looney Tunes really is a sad way to treat some of Warner Bros.’ most iconic characters. Luckily, Warner Bros. is about to change its Tunes, by bringing ‘em to Blu-Ray. 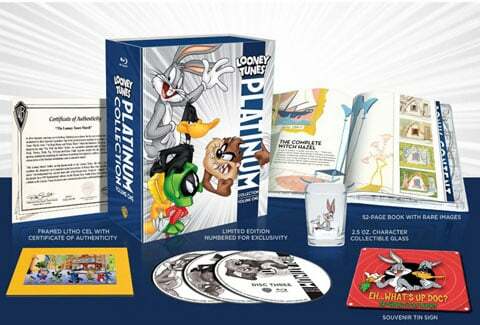 Warner Bros. Senior VP George Feltenstein has announced the studio will release the Looney Tunes Platinum Collection: Volume One in November. For the first time ever, 50 of the Looney Tunes best and brightest episodes will be enhanced for high definition. There will be two options with the Volume One set: a standard digibook version and an Ultimate Collector’s Edition. Both sets will contain two discs full of episodes, and a third disc chock full of bonus features. However, the Ultimate Collector’s Edition will be dressed to the nines. Running at $79.98, each set will be numbered for exclusivity, and will come with a 52-page color book. Other extras with the nicer set include a character shot glass, a tin magnet, and a certificate of authenticity. Apparently Warner Bros. expects everyone to be as excited about this as I am. A first volume always leaves room for a second and a third. If you really are excited about the Looney Tunes on Blu-Ray, I’d keep my eyes peeled for more announcements in the future. Until then, check out the specs for Volume One, below.